How to Survive Anything Book by Lonely Planet | Nerd Much? If you’re like us, you typically think of the worst possible scenario that could happen at any given moment and then think of how you would get out of that scenario. While it’s possible that we’ve seen Final Destination one too many times, it still helps to be prepared for the worst and weird ways you might die. With that being said, you might want to check out the How to Survive Anything: A Visual Guide to Laughing in the Face of Adversity book. 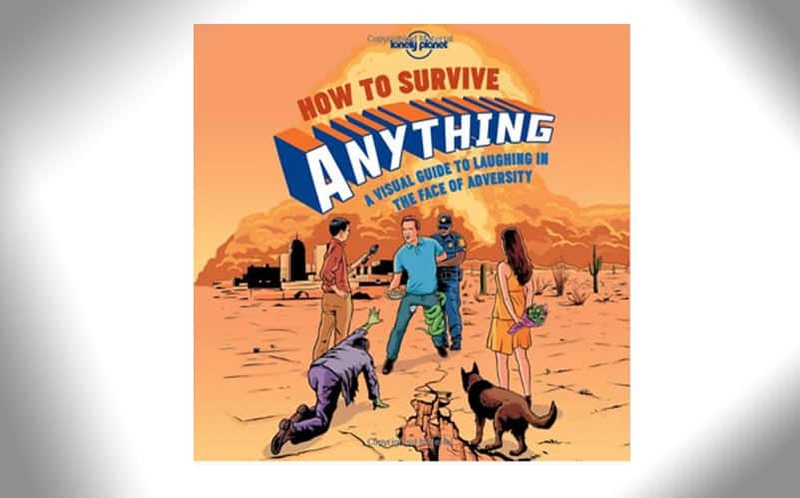 This book gives helpful tips on how to survive many of life’s challenges, such as an earthquake, sunburn, a snakebite, food poisoning, and even a zombie attack. The book will also show you how to survive superglue accidents, what to do when your parachute fails, and how to survive a foot-in-mouth situation. It’s all presented in a witty, graphic format for easy understanding and a few chuckles along the way. The book contains excellent ideas for both unusual and typical survival scenarios, and it makes the perfect nerdy coffee table book to add to your living room. It’s available now for $12.94.